This entry was posted on Tuesday, March 14th, 2017 by Frances Ryan. There seems to be a bit of interest in my on-going ankle recovery, specifically around running. So, I thought I’d give a wee update for those who’ve already asked—and for those who’ve not asked but might care! This post will also serve as a general “my experiences running after a break” post, to address those specific questions. After my initial “first run” four months ago, I noticed that my ankle was quite tender feeling. I also realised that my overall core strength (and lung capacity!) was in need of some work. I decided that I would be better off sticking to using an elliptical machine at home for a couple of weeks, which helped me to build up my leg muscles a bit. Then, three weeks after my first run, I went back out onto the road for a 2-mile run. I was determined to run a 5K by the end of the year (it was early December by then) so I had to increase my road mileage as well as my time on the elliptical. The work paid off though, and I managed to run a 5K on December 29th. 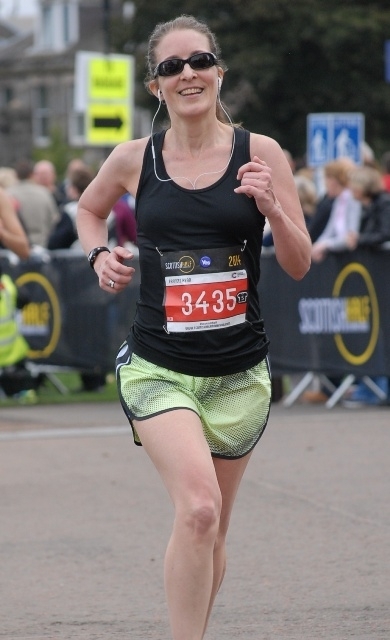 By the beginning of January, I had decided that I would be more than strong enough to run a half marathon in the autumn, so I signed up for the Scottish Half Marathon in September. (One I’ve done before, so I know that the course is fairly gentle!) I hadn’t planned to run any races this year but this challenge has actually made me work on my fitness with a bit more determination. By the end of January, I had graduated to a 4-mile distance. And in February I improved on my 4-mile and 5K times so I decided that I would increase to 5 miles in March. And yesterday I managed just that and more with a gentle 5.22-mile run. Well, a run with a bit of walking thrown in for good measure. My plan at the moment is to do 2-3 5K runs during the week and repeat the 5.22-mile course on the next three weekends. I will then attempt to increase to a 6-mile run by Easter Sunday and a 7-mile run by the end of May. My hope is that if I can keep working on speed with the weekday 5Ks and distance on the weekends, I should be able to push to a 10-mile run by the end of June. And by September, I’ll be ready to tackle those 13.1 miles at the race! I’ll start with the non-ankle struggles. Those, simply put, are weight- and laziness-based. You see, I got rather ill this time last year—just as I was starting to lose my winter weight and just as I was entering running season. That meant I wasn’t able to run, which meant that I put on a small amount of illness weight on top of the winter weight. Then, just as I was recovering and starting to run again, I broke my ankle. And that meant gaining even more weight. Now, I am not fat. I have never been fat. I am not at risk of becoming fat. But I was carrying an extra 10 pounds by the time I was fit enough to start running again and that extra weight really made a difference to my ability to breathe whilst running. I am still working to lose the rest of the extra weight (it’s easier now that I’m running more) but it really is still slowing me down. But it’s a general “out of shape” slow-down that is largely unrelated to my ankle. Now, the ankle struggles! Simply put, my ankle still gets quite sore. I would have thought that it would have been sorer at the bone level, but that’s not really the case. Instead, there’s this odd soft tissue pain that feels almost as if it’s throbbing a bit. The pain doesn’t happen when I’m actually running though. The pain happens when I’m resting. And I’ve noticed that the pain is more obvious when I’ve been active over several days. So, for example, if I do fair amount of walking (10,000+ steps) three days in a row, it aches a bit more. Once I throw a run or two in, it aches even more. The aching isn’t very intense and isn’t enough to stop me from being active. But it is a little frustrating because I am not accustomed to regular pain. It really just feels sore and tender, and certainly isn’t the kind of pain that would keep me from moving about. I have, however, noticed that the aching increases when I get a bit cold and wet. For example, after walking through some icy slush to get home on a cold winter’s evening, it was throbbing a bit more than normal. I have consulted with my doctor and have been told that all of what I’m experiencing is well within the normal range. My injury was quite simple as far as ankle breaks go (no surgery, thank God!) and there are no limits to my activities. I know that others made greater progress than I have in this time period, but I am also aware that I have two other major medical conditions which prevent me from pushing too hard, too fast. Still, I am getting there. Slowly.